Just putting the final touches to our new eBook, Niche Content Millionaire and sending drafts off to various friends for review. 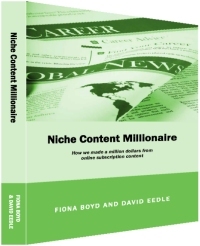 Niche Content Millionaire will be released this month. But you can make sure you secure your copy by registering now. ATM to check your account balance. largest of our businesses for more than $US1 million.